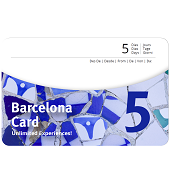 Departure Point The Barcelona Card can be collected from both terminals at Barcelona Airport or several locations in the city center. The Picasso Museum is included in the Barcelona Card. You can go to the Picasso Museum directly (anytime, any day) and skip the line with the Barcelona Card.